IT didn't take long for Theresa May's announcement about the UK's snap election to to trigger speculation about what the news would mean for Taoiseach Enda Kenny's timeline for stepping down as Fine Gael leader. In Leinster House two camps quickly emerged on Wednesday: In one camp there are those who believe the election would allow the Fine Gael leader to hold onto his mandate to lead for longer. While in the other the argument is that now is the perfect time for him to go. With speculation mounting that the Fine Gael leader will remain as leader until the October budget, the election could prove an opportune diversion. He has largely been accepted as our 'Brexit Minister' and has done the leg-work ahead of the negotiations. Meanwhile, the Taoiseach has already said he wants to see a power-sharing government formed in Northern Ireland before stepping aside to make way for Mr Varadkar or Simon Coveney. Mr Kenny, who on Thursday becomes the party's longest serving head of Government, said that and Brexit should "take precedence over anything else". Government sources last night admitted the ongoing stalemate in the North could result in a second Assembly election to coincide with the UK vote on June 8. Talks in Stormont are due to resume today but sources close to the negotiations said there is a fear they have become a 'box-ticking exercise'. If a new election is called, that would see Mr Kenny's departure date put back until at least the middle of summer. However, not everyone is convinced that the U-turn by Ms May who looks to be seeking a fresh mandate to become the 'Brexit PM', is cause for delay in solving Fine Gael's leadership issue. "Tomorrow the Taoiseach surpasses John A Costello as FGs longest serving Taoiseach, I congratulate him for that and genuinely wish him well. What I have to say following on from that is not personal but logical: when it comes to Brexit, it's quite clear that Britain is pausing for breath to focus on their election and this gives us an unforeseen opportunity to do same ahead of what will be a marathon 22 months of negotiations. "The two year article 50 clock is already ticking. Britain's election consumes two months of that, and gives us an unforeseen opportunity to pause for breath and assess ourselves ahead of the Brexit negotiating process. 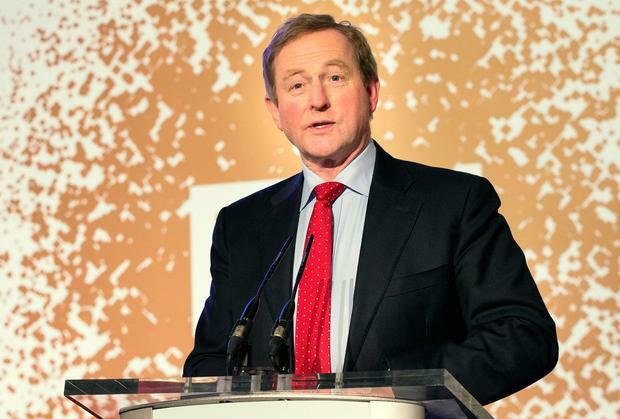 "The Taoiseach has said he is not contesting the next election: this is a fact. Every European leader is aware of it. Therefore, it would make ample sense to allow a new Taoiseach to take place before Britain elects a new Government in June in order to take us through this difficult period ahead and not be distracted by domestic issues or leadership contests any longer." And other sources said Theresa May's calculated move offers an ideal opportunity for Fine Gael to simultaneously sort itself out. Social Protection Minister, Leo Varadkar, was the only minister to appear in public yesterday, less than an hour after the shock press conference at Downing Street. Is he worried Mr Kenny might use the latest upheaval in Britain to stick around longer than planned? "Not in the slightest." Mr Varadkar also ruled out a similar situation here and said a snap election in Ireland should not be on the table in the aftermath of the leadership contest. "I think it would be wrong for the new leader of Fine Gael to pull the rug out from under people we've made a partnership with. I wouldn't anticipate an early general election in Ireland," Mr Varadkar said. Despite the speculation in Leinster House however, the Taoiseach has yet to clarify how Tuesday's shock announcement from Number 10 will impact on his exit strategy, if at all.